Lattice Boltzmann methods (LBMs) are used to study flow problems on the statistical scale. Their relatively simple, (mostly) local algorithmics and their meso-scale nature make these methods attractive for both physicists and computer scientists. The latter is particularly true with respect to the field of high performance computing. In this seminar, the basic theory of the Lattice Boltzmann methods is discussed and implementational concepts are presented for single-core and multi-core architectures. Besides, particular aspects such as grid refinement and application of LBMs to more complex systems such as multiphase flows are addressed. The handouts will be printed for you. If you want to have a closer look into the material beforehand, you are welcome to use the electronic versions from below. 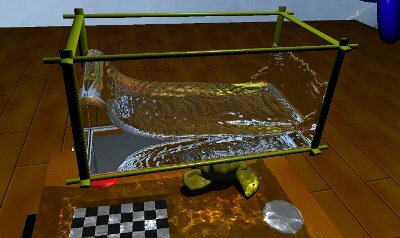 Left : Interactive fluid simulation (based on Lattice Boltzmann method) and visualization (volume tracing, photon mapping). Right: Breaking dam simulation. S. Succi, The Lattice Boltzmann Equation for Fluid Dynamics and Beyond, Oxford University Press, 2001. M.C. Sukop and D.T. Thorne, Lattice Boltzmann Modeling: An Introduction for Geoscientists and Engineers, Springer, 2006. Topic-specific literature will be handed out to the individual participants of the course by the advisors. The paper template is available here. Usage of Latex is required. This page was last modified on 24 January 2014, at 16:33.